Politics and rock music have always gone hand in hand - and that was never more true than in the '80s when issues like the famine in Ethiopia ("Do They Know It's Christmas", "We Are The World"), apartheid in South Africa ("Sun City") and, here in Australia, Aboriginal land rights ("Beds Are Burning") all prompted musicians to put their thoughts to music. This week in 1989, a Scottish band that had only recently become known for their activism scored the highest new entry on the ARIA chart with a political anthem (well, actually three anthems, but we'll get to that) that topped the chart in the UK. On top of the Australian chart this week 25 years ago were... The Proclaimers. Still. The final US number 1 of Chicago's career was written by Diane Warren, as their previous single had been, and had been offered to Cheap Trick, who opted to record "The Flame" instead. I remember this getting a lot of attention at the time on account of the involvement of Michael Hutchence, Tim and Jon Farriss, Big Pig's Sherine Abeyratne and video director Richard Lowenstein, but despite all the big names, it wasn't that great a song. This world music-tinged third single from Union didn't match the success of Toni Childs' earlier hits, but with the album enjoying an extended run in the top 20, she probably wasn't complaining. Released between the guitarist's two biggest albums, this four-track EP contained new studio track "The Crush Of Love" and three live recordings. Yet another single to come from Young Einstein, "Music Goes Round My Head" was one of only two songs by the highly influential Australian punk/rock band to make it into the Australian top 40 (the other was 1986's "Just Like Fire Would", which got to number 29). And, like Paul Kelly's contribution to the soundtrack, "Dumb Things", this track had originally appeared on an album that'd been out for some time - The Saints' Prodigal Son was originally released in April 1988. The song itself was a remake of a 1967 single by another legendary Aussie rock band: The Easybeats. A few weeks ago, I was pleased to be reminded of "Nobody's Perfect", a track by Genesis member Mike Rutherford's side-project that I'd completely forgotten about. But, unfortunately, there's no forgetting this song - yep, it's another Australian chart-topper of which I'm none too fond. It's hard to be as dismissive of "The Living Years" as I am of "Don't Worry Be Happy" or "I'm Gonna Be (500 Miles)", though. This song's lyrics are actually quite poignant, detailing co-writer BA Robertson's regret about the issues he never got to resolve with his late father. Musically, though, I found the song a bit cloying. Originally released before "I Want Your Love", this earlier Transvision Vamp single got another shot at success - but didn't rise any further than this debut position. The song was a cover of the 1980 debut single by little known new wave band Holly And The Italians. Here's another song that would also end up being a bigger hit in the UK when it was covered - in this case by Tin Tin Out featuring Emma Bunton in 1999. But, unlike "Tell That Girl To Shut Up", "What I Am" was a success first time out in Australia and the US for alternative rock band Edie Brickell & New Bohemians, reaching as high as number 7 in the US. The band is still together today, having released albums every so often, although none as big as debut Shooting Rubberbands At The Stars. Meanwhile, singer Edie has also recorded solo albums and is married to Paul Simon. It'd been four years since a new studio album from Simple Minds - and this lead single from Street Fighting Years made it clear the band had moved on from their stadium synthrock sound. Incorporating the melody of the traditional Irish folk song "She Moved Through The Fair", "Belfast Child" dealt with the conflict that continued to rage in Northern Ireland, while the single's B-side, "Mandela Day", was first performed at the concert held in honour of Nelson Mandela's 70th birthday in 1988. 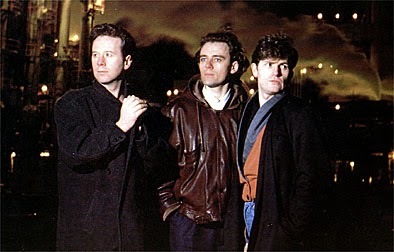 A third politically-influenced track, a cover of Peter Gabriel's "Biko", was included on the 12" version of "Belfast Child" (or Ballad Of The Streets EP, as it was also known). Next week: Those bloody Proclaimers strike again! 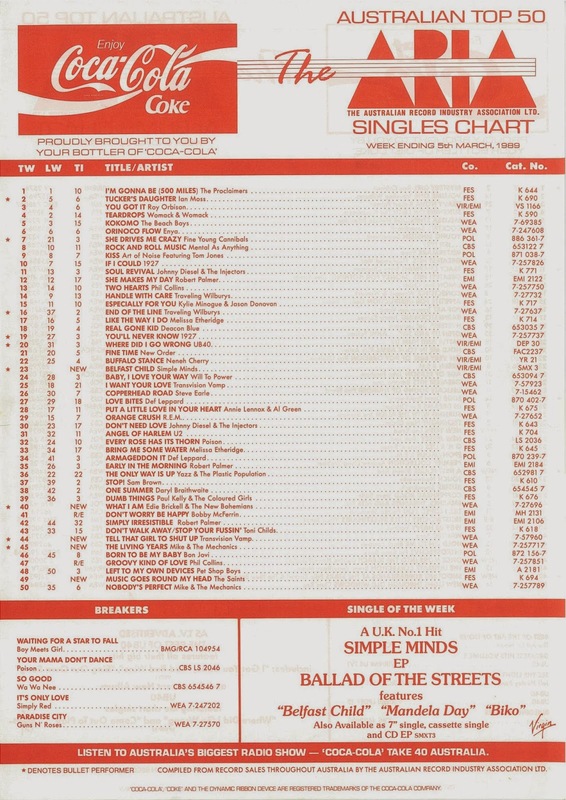 Plus, one of my favourite songs from 1988, which spent what seemed like forever as a breaker, finally cracks the top 50. I'm relieved to see 'Music Goes Round My Head' finally cracking the top 50, after spending 5 weeks as a breaker. I remember watching this top 50, from #47, on Rage. I think next week was the first full top 50 I caught. Tin Tin Out/Emma Bunton's version of 'What I Am' actually wasn't a bigger hit than the Edie Brickell version in Oz. It peaked just outside the top 50 from memory. Thanks for adding 'cloying' to my vocabulary (just looked it up). Yes, thank you once again for pointing out my obvious error. I think I must have been looking at the chart peak for What Took You So Long by mistake. I seem to have been making a lot of these lately! Commentary amended. PS I noticed that 1927 bullet this week to #19 from 27, ha ha. Also, ARIA added a superfluous 'the' to New Bohemians, while omitting one from The Saints' single. The Young Einstein Soundtrack, the very first CD I bought, although that wasn't until July 1990. I had no idea that "Tell That Girl To Shut Up" was originally released before "I Want Your Love". They still had another great track to follow soon - "Sister Moon" which didn't do that much on the charts either. It was a good single, but perhaps a bit too slow? I remember when Edie Brickell & New Bohemians were the 'it' band around this time in 1989 and people were raving about them and the album. I still have not seen Young Einstein. Not sure I ever plan to. I did however see Footrot Flats at the movies.